Caterham went into administration in October and made 230 staff redundant. Caterham's administrator says talks are ongoing with "three interested parties" as they look to get the team on the Formula 1 grid next season. The team went into administration in October and made 230 staff redundant. Joint administrator Henry Shinners told BBC Sport: "We want to give the team every chance of surviving so we are not setting a deadline." However, testing for the new season begins on 1 February with the first race on 15 March in Australia. Shinners, of London firm Smith & Williamson, conceded that as some staff who were made redundant have gone on to find new jobs, the risk of buying the team is "increasing". 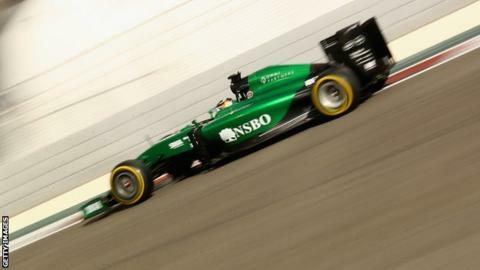 Caterham missed the United States and Brazilian Grands Prix after going into administration but a successful crowd-funding project saw them compete at the season finale in Abu Dhabi. Shinners added that being in Abu Dhabi, where Will Stevens and Kamui Kobayashi drove for the team, was useful as the administrators were able to hold talks on-site with two interested parties - but nothing is yet definitive. The Leafield-based team were given a further boost when they were earlier this month given special dispensation to use this year's car next season to make it easier to find a buyer. It means potential purchasers will not be under pressure to build a new car for next season, although it will be significantly off the pace compared to its competitors. If Caterham find a buyer and make it onto the grid next season they will need to re-employ staff and sign two new drivers.